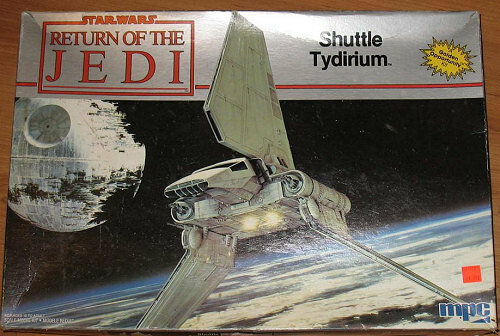 The Tydirium was the name of the shuttle captured by the Rebels and used to infiltrate General Han Solo’s commando team to the forest moon of Endor to destroy the Death Star II’s shield generator. As chronicled in the Star Wars movie, Return of the Jedi, the commando team was ultimately successful in large part with the help of small rather annoying and diabetes inducing cute furry creatures. Thanks to wikipedia for fleshing out details. The MPC Tydirium Shuttle kit is long out of production. This particular copy is from the original release of 1983. 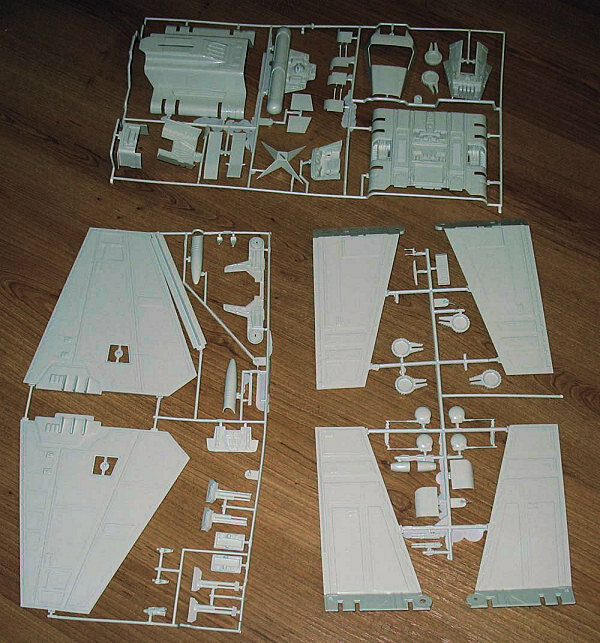 The kit consists of 62 parts mostly in a very light grey (almost FS36622) including one tinted clear piece and one badly done figure of Darth Vader. It comes with the cockpit interior as well as the ability to pose the wings in flight or in landing. The instructions are 80s minimalist and the paint guide is practically non existent as it is assumed that no painting is required. The parts seem to be in pretty good shape with minimal warping, but there is a lot flash to deal with so clean up will take some time. As one might gather, I’m a Star Wars fan and a kit like this holds a lot of appeal to me. I bought this kit at the Local Hobby Store recently when they bought a collection of old kits and put them up for sale at non eBay prices. 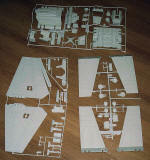 Despite the minimal parts, it does not look like it will be an easy build which is typical for a SF kit from the 80s.